Nothing creates an inviting atmosphere quite like the magic of a real fire. It is now possible to have the beauty and warmth of an open fire without the need for wood or gas. All these fireplaces are fuelled with bioethanol which is a clean reusable energy. We can provide you with units from 60cm to 1.20meters long. 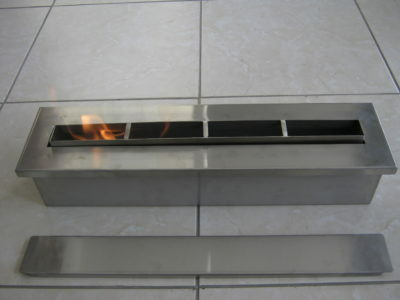 With bioethanol you will not need to install a flue or chimney. In all of our burning chambers there is a ceramic fiber wool. This material is used to absorb the liquid so there Is no possibility to spill the bio ethanol and it also ensures a homogenous flame.